DENVER (AP) — The Obama administration is pushing Congress to ensure that enough money is available to fight destructive wildfires as California recovers from a spate of blazes and other fire-prone states brace for another hot, dry summer. As part of the push, Agriculture Secretary Tom Vilsack intends to discuss 2015 budget proposals by the administration Tuesday in Colorado, where deadly fires in 2012 and 2013 destroyed hundreds of homes. The plan calls for funding to equal 70 percent of the estimated 10-year average firefighting cost. His plan also calls for an additional $954 million disaster funding pool. In the past, when firefighting funds ran out, money has been borrowed from fire-prevention programs. The 2015 budget request for firefighting is $2.2 billion, up from $2.1 billion in 2014. Under the plan, borrowing from other programs would only occur if the $954 million in disaster spending is exhausted. “It is not in the interest of forest health to transfer funds from forest restoration that can prevent future fires,” Vilsack said in a statement. During his stop in Denver, Vilsack also intends to announce prevention measures that include designations to help 94 national forest areas in 35 states address insects and diseases that turn trees into tinder. The designations under the 2014 Farm Bill will allow the Forest Service, working with states and other partners, to move more quickly and broadly to combat outbreaks. “Millions of acres in Colorado’s forests and throughout the country have been devastated by insect and disease epidemics,” said Colorado Sen. Michael Bennet, who introduced a bill on forest insect and disease treatment last year that was co-sponsored by fellow Coloradan Sen. Mark Udall, Sen. Ron Wyden of Oregon and then-Sen. Max Baucus of Montana. “We made sure to include environmental safeguards while putting in place tools for expediting treatment of these at-risk areas,” Bennet said in a statement Tuesday. In addition, a Farm Services Agency program will support for the first time the harvesting and transportation to energy facilities of insect-infested trees from National Forest Service land. In drought-stricken California, wildfires that broke out in San Diego County last week caused more than $20 million in damage. The state firefighting agency went to peak staffing in the first week of April, instead of its usual start in mid-May. 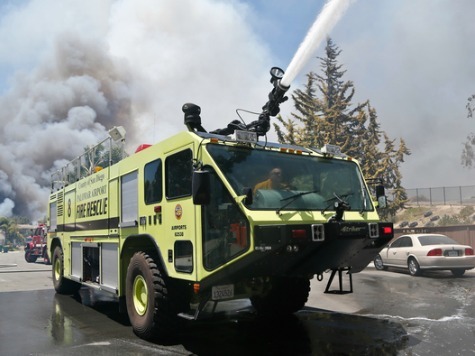 Thousands of additional firefighters may be needed in the future, California Gov. Jerry Brown told ABC’s “This Week,” adding that California is on the front lines of climate change. In Colorado, red flag warnings on the risk of wildfires were posted for Colorado Springs and other parts of the state as well as New Mexico and Arizona. The danger is also high in the Texas Panhandle and southwestern Kansas.